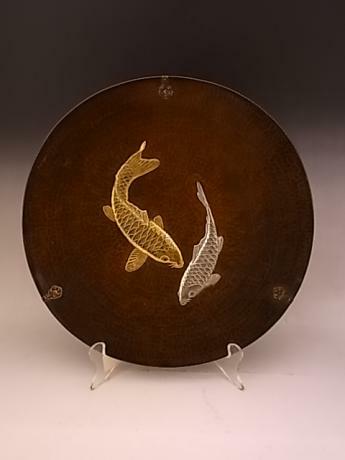 Japanese mid to late 20th century copper alloy plate with KOI design by FURUYA Company in Hiroshima, Japan. This type of work is called DOCHU. The plate comes with TOMOBAKO, or original artist signed wooden storage box. The plate measures 10 1/8" in diameter and 3/4" tall. 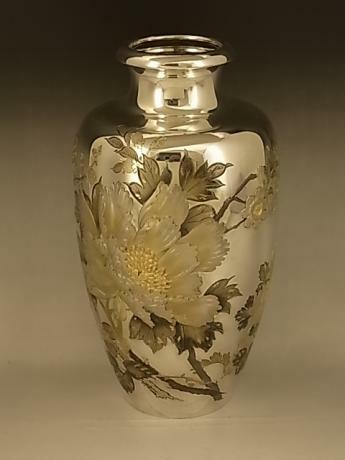 Japanese mid 20th century pure silver vase. The wonderful vase has a floral design of peony, plum, rose and chrysanthemum. Signed YUKIKATSU or KOUSHUU. By artist TAKAI YUKIKATSU/KOUSHUU. The vase comes TOMOBAKO, or original artist signed wooden storage box. 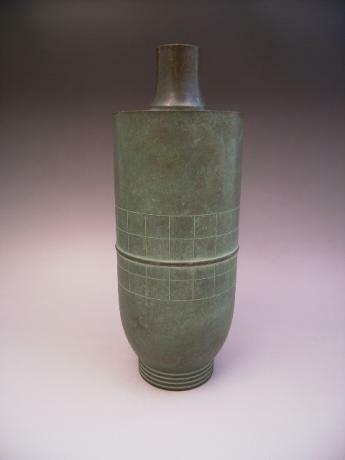 The vase measures 9 1/2" tall by 5"..
Japanese early Showa Period (1929) pure copper vase. 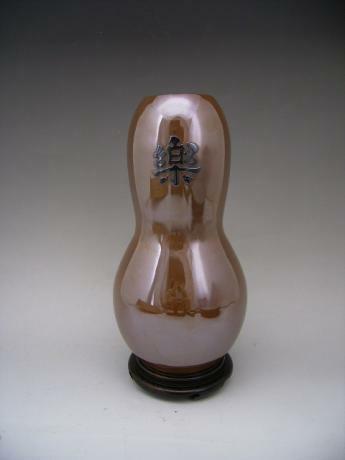 The vase is in the shape of a gourd with the kanji "RAKU" written on the front for "joy". On the back of the vase is a poem. The vase is signed ICHIYA with KAO symbol. It comes with TOMOBAKO, original artist signed wooden storage box. The b..
Japanese Meiji Period bronze pair of playing puppies. One puppy has one paw up on the other puppy and is playfully biting its ear at the same time. The paw touching the other puppy is attached to the lid of the cavity of the lower puppy. It appears to be an incense holder. 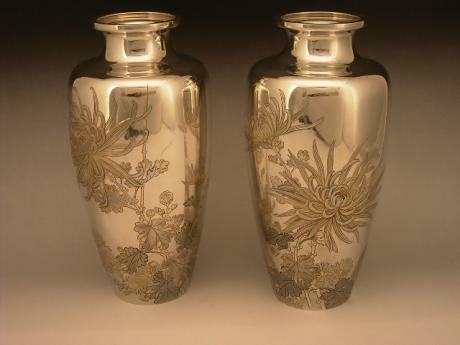 The pair measures 6 ..
Japanese circa 1900 pair of silver vases. The vases have the design of chrysanthemum blossoms done in a wonderful chisel and low relief techniques. Some of the areas are gilded and others are done in Shakudo. Signed on the back of each vase, SEISAI. ALso each vase has JUNGIN MITSUKOSHI stamped..
Japanese 20th century bronze vase. 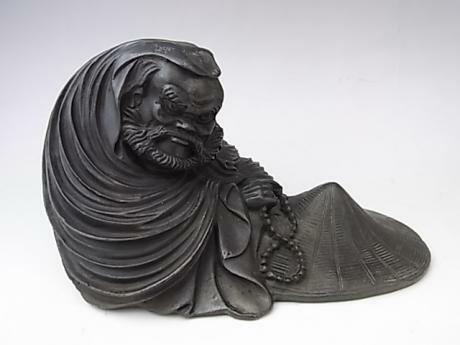 Made by well known Japanese bronze artist, HASUDA SHUGORO (b. 1915 - ). Born in Kanazawa, Japan and graduate of pretigious Tokyo Arts College in 1938. HASUDA SHUGORO has been the receipient of numerous important awards in Japan for his work. 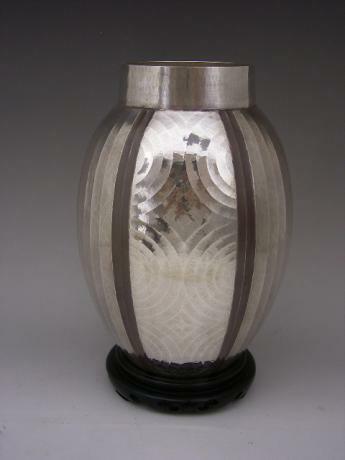 In 1991 he was aw..
Japanese mid 20th century silver vase with beautiful hammered design. The vase is marked JUNGIN for pure silver on the bottom of the vase. The vase comes with TOMOBAKO or original artist wooden storage box. The wooden box has "vase" written on the outside and SHOBIDO with stamp on the inside. 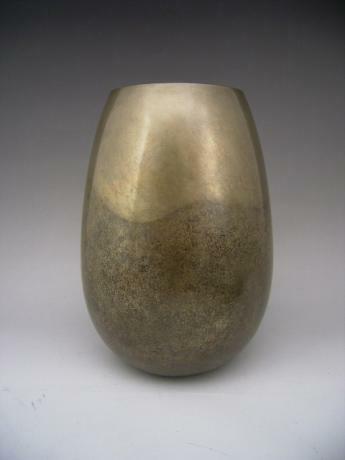 ..
Japanese 20th century bronze vase by bronze artist KANAOKA, SOUKOU. Soukou was born in Kanazawa in 1910 and died in 1982. This particular vase was on exhibition at the 6th Dento Kougei Ten (Exhibition of Japanese Traditional Crafts) held in 1977. 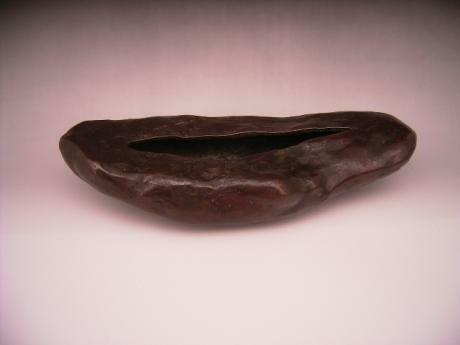 The vase still has the letter which states that ..
Japanese mid 20th century bronze oblong natural rock shaped bronze flower container. Made by bronze artist Misawa Hiroshi from Shimosuwa Town in Nagano Prefecture. Misawa was the director of the prestigious NIFU Exhibition in Tokyo for 50 years. This flower container comes with it original TOMO..